I spent the last week travelling through these two southern states to observe fieldwork for the ongoing CSDS pre-poll election studies. Unlike for Assam and West Bengal, these studies were being fielded before election day because of the quick turnaround on analysis. 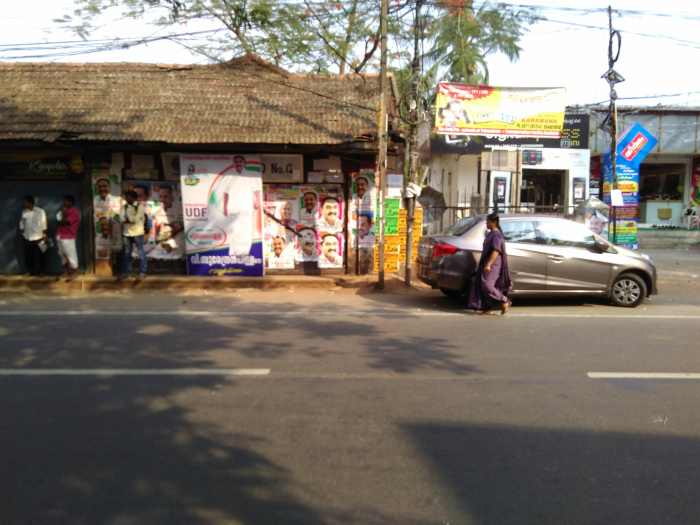 In both states, but particularly in Kerala, signs of the imminent elections were everywhere. Billboards and posters for the governing United Democratic Front (UDF) competed for space with the challenging Left Democratic Front (LDF). The BJP also had established a strong campaign presence in the capital of Thiruvananthapuram and the surrounding areas. In Tamil Nadu, I saw fewer campaign posters, particularly in the cities of Madurai and Chennai. In the villages surrounding Madurai, however, the two-leaf symbol of the governing Anna Dravida Munnetra Kazhagam (ADMK) and the rising sun symbol of the challenging Dravida Munnetra Kazhagam (DMK) decorated the walls of houses. Flags from the All India Forward Bloc (AIFB), which won the constituency I was visiting in 2011, were also in abundance. 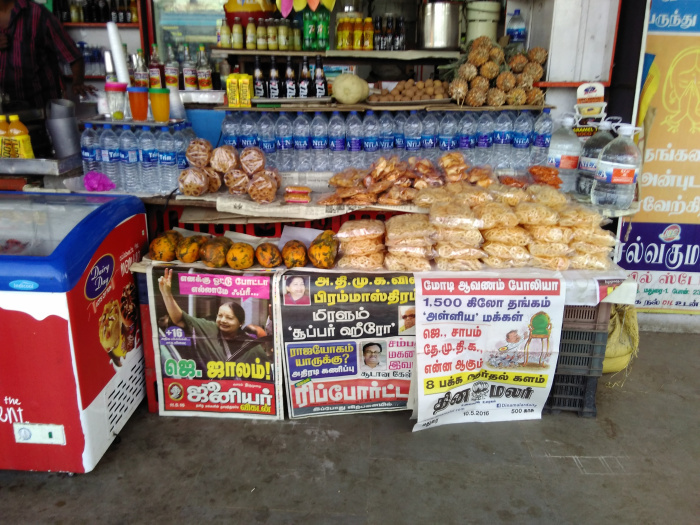 By the roadside, streamers with pictures of Jayalaalithaa, Tamil Nadu’s chief minister, or Karunanidhi, her rival from the DMK, hung from different campaign rally sites. Like my previous post, a concise summary of the field visit is will be presented here rather than an extended narration. On May 5, I flew down to Thiruvananthapuram by way of Chennai and checked into the guesthouse at the University of Kerala campus in Kazhakuttom. On May 6, I observed the full-day training for Kerala field investigators at the University of Kerala. Sandeep Shastri, National Coordinator of the Lokniti Network and Pro Vice Chancellor at Jain University in Bangalore, led the training. On May 7, I met up with two field investigators working in Nemom, a suburb that is 8 km south of Thiruvananthapuram city center (the assembly constitutency of Nemom was won by the Communist Party of India (Marxist), or CPM, in 2011). We met up late in the afternoon, around 4 PM, and so I only observed one interview since so many listed respondents were not home. On May 8, I met up with two other field investigators working in the village of Pallikkal, which is about 40 km north from Kazhakuttom in the assembly constitutency of Varkala (which was won by the Indian National Congress in 2011). Like the day before, we met late in the day — close to 4 PM — and so I could only observe two interviews. Like in Nemom, many of the selected respondents were not home at the time of our visit. On May 9, I travelled by overnight train, the Ananthapuri Express, from Thiruvananthapuram to Madurai in Tamil Nadu. Madurai is the third largest city in Tamil Nadu, home to the legendary Meenakshi Amman temple complex. On May 10, I met up with four field investigators working in the area around Usilampatti, a town that is 40 km west of Madurai. I observed the work of FIs interviewing respondents in the countryside villages surrounding Usilampatti: Nallathathunayakkappatti, Sangakavundanppatti, Palaiyur, Karisalpatti, and Kattarripatti. On May 11, I squeezed in a morning visit to the Meenakshi Amman temple of Madurai before joining the FIs conducting in the city of Usilampatti. The assembly constituency of Usilampatti was won by the All India Forward Bloc (AIFB) in 2011. I took an overnight train, the Ananthapuri Express once again, from Madurai and arrived in Chennai on the morning of May 12. In the morning, I ate breakfast at Saravana Bhavan, visited the museum at Fort St. George, and stopped by Higgenbothams Booksellers and Stationers before heading to the airport and flying back to Delhi. 1. Urban vs. rural areas: As with Assam and West Bengal, respondents in urban areas were more difficult to locate than respondents in rural areas. People on the street and in the neighborhoods of selected respondents were less likely to know the location of other selected respondents in urban areas than in rural areas. This meant that a lot of the time for fieldwork in urban areas (especially Menom) was spent asking people on the street if they know the location of selected respondents and walking around to identify households. In villages, particularly in village centres where older men gather, people were much more likely to identify the names of selected respondents and point us towards their houses. 2. Low response rate in Kerala: Both researchers from the CSDS office in Delhi and the Lokniti coordinator for Kerala, Professor Sajad Ibrahim Ali, informed me that historically the response rate for Kerala is lower than that of other Indian states. This has been the case in state and national election studies, and as the data were being collected for this election study, Professor Ibrahim informed me that it would also be the case this time. Several team members from Kerala informed me that response rates are higher in north Kerala than in south Kerala, and particularly in Theruvananthapuram and the surrounding areas. No one had a clear answer about why this is. Some field investigators speculated that it had to do with the number of people working who were not home during the day. On my two admittedly short observations of fieldwork, field investigators experienced challenges locating houses and arranging interviews with the selected respondents once they had located the households. 3. Caste in Tamil Nadu: Ranith, one of the field investigators whom I was observing, informed me that caste was a very sensitive issue in many of the villages around Usilampatti. The Lokniti state coordinator for Tamil Nadu, Professor P Ramajayam said, also said that Usilampatti is notorious for intercaste violence. Violent caste-related incidents in Tamil Nadu are most common between different backwards classes, such as Gounders and Vanniyars, and Scheduled Castes (SC) or dalits. In some of the villages we visited, it was dangerous for field investigators to even raise the issue or ask questions about it (every CSDS election study includes demographic questions about caste). For some interviews, the field investigators would therefore skip any such questions in the questionnaire. Field investigators in Tamil Nadu have to carefully navigate the complexities and sensitivities of caste while collecting data. That all four field investigators were from Usilampatti and the surrounding villages was critical, as they knew which villages it was safe to ask about caste. 4. Religion: While Tamil Nadu is a state with a large (88%) Hindu majority, Kerala is a state with sizable Muslim and Christian minorities (54% Hindu, 27% Muslim, 18% Christian). 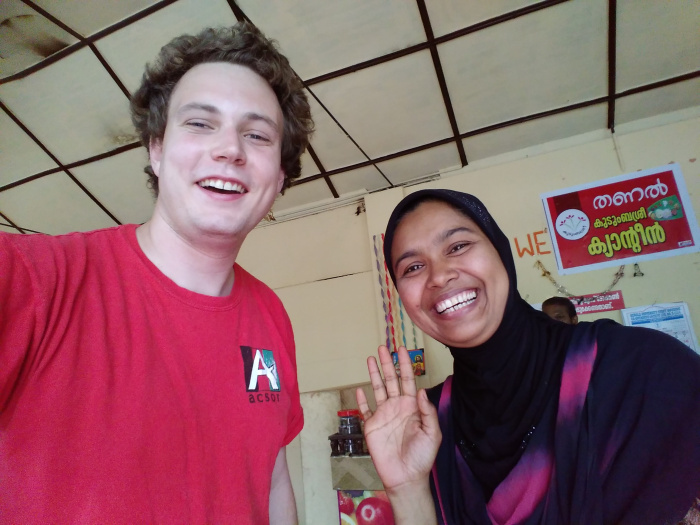 The field investigators whom I observed in Kerala expressed skepticism that response rate was different across religion, though they said it was sometimes harder to speak with women in Muslim households (all the field investigators with whom I worked in Kerala were female). 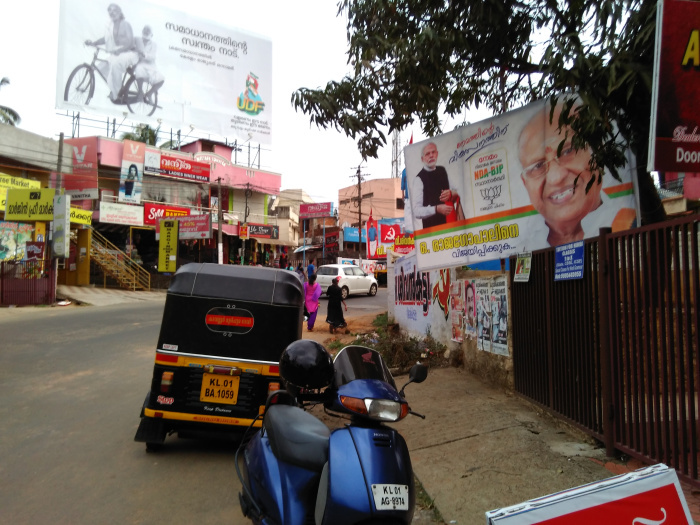 Though the neighborhood we were interviewing in Pallikkal was largely Muslim, I did not spend enough time in the field in Kerala to receive an informed impression about how religion shapes fieldwork in Kerala. 5. Gender: The gendered dynamics of interviews which I observed in Assam and West Bengal were not as much in evidence in Kerala and Tamil Nadu. That is to say, while female respondents who were selected were nearly always interviewed in the presence of their father or husband in Assam and West Bengal, this did not seem to be the case in Kerala and Tamil Nadu. However, any difference may be due to the fact that the interviews I observed with female respondents in Kerala and Tamil Nadu were all conducted by female interviewers; in West Bengal, the interviewers whom I observed were male. In Tamil Nadu, the team of field investigators included two male FIs and two female FIs. This was for the safety of female FIs when traveling through villages in the countryside. It also allowed for male FIs to interview male respondents and female FIs to interview female respondents. 6. Education level: For a number of respondents in Usilampatti and the surrounding areas, education level was so low that respondents could not understand the content of many of the questions. One respondent, for example, responded to a question about Prime Minister Narendra Modi’s different government initiative by saying that she did not know who Narendra Modi is. Field investigators thus had to make spur-of-the-moment judgments about which questions to ask and which could not be reasonably asked of the respondents. In the case of illiterate respondents who lacked even basic knowledge about political affairs in Tamil Nadu and India, the focus was on collecting correct demographic data and ensuring that the respondent answered the question about voting intention. 7. Timing: Many of the respondents in Nemom, Pallikkal, Usilampatti, and the surrounding villages of Usilampatti were not home during the daytime because they were at their jobs. In the case of villages around Usilampatti, there was one village for which all or most of the villagers were out in a field working under the MGNREGA (Mohandas Gandhi National Rural Employment Guarantee Act). We went to the field to find the villagers assembled in the shade of the trees. When the FIs began conducting interviews with selected respondents, a village clerk from the panchayat (local administration) showed up and demanded that the interviews cease. The local official told the villagers not to answer any questions being asked by survey researchers. The FIs tried talking to the clerk and showed them their official CSDS letter, but the clerk insisted that we leave. This incident showed how field investigators sometimes must deal with obstacles presented by local government. It also illustrated how unemployed workers receiving benefits through MNREGA (which guarantees 100 days of agricultural work a year) may be less likely to be interviewed for surveys. 8. Economic migration: Many of the selected respondents who were not available in the villages surrounding Usilampatti had left their village to work in either a larger city of Tamil Nadu or another state like Kerala. Such economic migration meant that many selected respondents in a given village could not be interviewed. My pictures below. Unfortunately, my phone failed me on the date of May 6 so I lost pictures from the training workshop at the University of Kerala. What was perhaps most visually striking in Tamil Nadu was the placement of beautiful towering temples with elaborate carvings in village centres, even in the tiniest and poorest of villages. Counting Day is only three days away. CSDS should have some analysis in the papers following the announcement of the election results.